KB is an attractive, vivacious young woman of 35. She came to me because she was self-conscious about her poor posture. She was round shouldered and sway backed. She also had sciatica. After 10 sessions, she noticed significant improvement; her back was feeling stronger and ‘straighter’. KB has continued to improve; she is now able to control her sciatica. 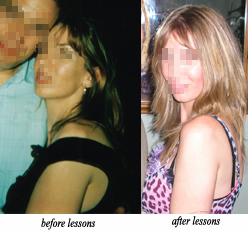 She also uses the knowledge she has acquired from her Alexander Technique lessons to help her yoga postures.After 10 sessions, she noticed significant improvement; her back was feeling stronger and ‘straighter’. KB has continued to improve; she is now able to control her sciatica. She also uses the knowledge she has acquired from her Alexander Technique lessons to help her yoga postures. The following is an extract from an article featuring one of Stephanie’s clients published in the Daily Mirror, December 23rd 2004. When college lecturer Dawn Branigan, 39, was bullied at work, her shoulders went up to her ears and her head jutted forward. “I was overloaded with work and under pressure. I started to walk with my head jutting forward, the muscles in my neck were shortening and my back was compressing. Dawn went to see Alexander Technique teacher Stephanie Smith about her voice. Stephanie says: “Dawn’s upper body was so tense that she was almost bent double. I showed Dawn how to lift and expand her rib cage and not restrict her lungs, allow­ing the spine to lengthen and widen, and breathe with her diaphragm at the top of her tummy. We do this by asking the pupil to let their neck be free in order for the head to be supported by the spine and allow the head to roll into a natural balance. “After two 45-minute sessions with Stephanie, I wasn’t struggling with my voice and, after a few more, I felt calm enough to challenge my boss. I was thinking more slowly and no longer panicking when she came near me. My voice even deepened and I was able to move in a less flappy way so I had more energy.